Apple’s new iPad hit store shelves today. That means that along with the lines at the stores and the requisite applause of store employees cheering people who buy them, there were among the many iPad buyers today people who just couldn’t wait to get the gadget torn apart. The analysts at the market research firm IHS iSuppli, considered by the investment community to be the most reliable of the organizations that conduct teardowns, were among that set. Today, somewhere in Southern California, an iSuppli analyst stood in line at a store and promptly took an iPad to a lab, where it was torn into, initiating the interesting process of estimating what it all cost to build. 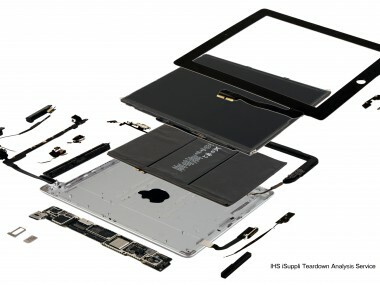 Here’s what iSuppli’s team found: First off, there weren’t many changes from the last iPad, in terms of suppliers. “It’s most of the same characters we saw last time around,” analyst Andrew Rassweiler told me today. Wireless chipmakers Qualcomm and Broadcom both reappeared — Qualcomm supplying a baseband processor chip, Broadcom a Bluetooth and Wi-Fi chip, TriQuint Semiconductor suppling some additional wireless parts. STMicroelectronics once again retained its position supplying the gyroscope. Cirrus Logic supplied an audio codec chip. The 16 gigabyte, Wi-Fi-only iPad that sells for $499 costs about $316 to make, or about 63 percent of the device’s retail price. On the upper end, the 4G-ready 64GB model that sells for $829 costs about $409 to make, or about 49 percent of the retail price. The new cost figures represent an increase of between 21 percent and 25 percent, depending on the model, from the iPad 2, which iSuppli tore down last year. So what did they find inside? An expensive Samsung display, for one thing. All those millions of pixels don’t come cheap. ISuppli analyst Andrew Rassweiler estimates that the display, which cost $57 on the iPad 2, has grown in cost to $87 on the latest iPad. Rassweiler says that two other vendors, LG Display and Sharp Electronics, have inked display supply deals with Apple for the latest iPad, but only Samsung is thought to have fully ramped up production. Depending on the vendor, the display may cost as much as $90, he said. One set of components remained essentially the same as before: Those that drive the touchscreen capabilities. Rassweiler says that three Taiwanese companies, TPK, Wintek and Chi Mei, supply parts related to driving the central interface feature of the new iPad, but he says to expect a major shift in how Apple handles the touch interface on future iPads. The combined cost of cameras, including the front-facing and back camera, is pegged at $12.35, more than three times the cost of cameras found on the iPad 2, Rassweiler says. But it’s essentially the same setup as that on the iPhone 4, he says. As has been the case with cameras, the identity of the supplier wasn’t easy to determine because they try hard to hide identifying information from the prying eyes of teardown analysts. The candidates, however, include Largan Precision Co., a Taiwanese supplier of camera modules to wireless phone companies, and Omnivision. On the iPhone 4S, a research firm called Chipworks identified the supplier of the CMOS sensor in one of the cameras as having come from Sony. As with other Apple devices, the main processor chip is an Apple-made A5X processor, one manufactured under contract by Samsung. The estimated cost of that chip is $23, up from $14 on the iPad 2. Another part that’s more expensive than on the last iPad, but also better for a variety of reasons, is the battery. This one is estimated to have cost Apple $32, up from $25 on the iPad 2. But it constitutes a significant upgrade, Rassweiler says, with 70 percent more capacity than before. Apple benefited in part by lower prices in the lithium polymer material used to make the battery, offsetting the cost of adding a vastly improved battery. ISuppli wasn’t the only outfit conducting teardowns of the iPad today. An enthusiast site called iFixit that encourages consumers to learn how to repair and upgrade their own electronics, flew technicians to Australia to conduct its own teardown analysis.